The Chico River, covering the regions of Cordillera and Cagayan Valley, is the longest tributary of the Cagayan River with a length of 174 kilometers. Given the expanse it covers, Kalinga and Bontoc communities who reside on its banks refer to it as ‘the river of life’. These communities are made up of thousands of indigenous people who rely on the Chico River mainly for the irrigation of their rice fields and domestic consumption. The land is also considered to be one of the most productive in the entire Kalinga province, given its viability for wet and rice farming. Not only did the river play a most integral role in the survival of the indigenous communities that surround it, it also developed a deep and distinct significance to the communities’ culture1. Indigenous peoples view their ancestral domain not only as a place of residence and from which they draw resources for survival but also as the basis for their identity and way of living. These communities were faced with a threat upon the conception of the Chico River Basin Development Project back in 1965. The project was set in motion in 1973, prompted by an oil price hike that led the Marcos administration to secure its feasibility. The technical feasibility study was completed by German firm Lahmeyer International in cooperation with the Engineering and Development Cooperation of the Philippines without the knowledge of the indigenous communities directly affected by its implementation. The villagers would only be made privy to this information in 1974, when the government was already preparing for the construction of 2 out of 4 dams. In addition to this, commercial logging operations by Cellophil Resources Corporation were also willfully condoned and accommodated by the state. The real implications of this project were found to be severe and substantial. With it, the displacement of an estimated 100,000 people from the Kalinga and Bontoc groups was set and non-negotiable, along with the submerging of 2,000 hectares under rice cultivation and 2,500 hectares under coffee and fruit plantations2. Opposition to the project swiftly mounted within the tribes until the movement was organized and propelled. Overtures made by the Marcos administration were rejected with the communities expressing a steadfast devotion to their ancestral domain. Despite militarization and numerous attempts to defuse the opposition, it went on to resist the project for the next three decades. We call to mind Macli-ing Dulag, leader of the Butbut tribe from Kalinga province and one of the frontrunners of the struggle against the proposed Chico River Dam Project. On 24 April 1980, state forces identified to be elements from 4th Infantry Division of the Philippine Army opened fire on opposition leader Dulag in his own home. His murder prompted the amplification of the rallying cry behind the opposition in the form of the establishment of Cordillera Peoples Alliance. This led to the eventual abandonment of the World Bank-funded Chico River Dam Project and other commercial logging schemes years after. Currently, projects backed by corporations are still being drafted and deployed in the Chico River. Despite the shelving of the first project in the 1980s, the Duterte administration are encouraging proposals as part of its ‘Build, Build, Build” program. Last 28 February 2018, the National Economic and Development Authority announced that the Duterte administration provided the green light for 3 Chico River mega dam projects expected to be accomplished in the next 3 to 4 years. One of these is a 52-megawatt pump irrigation project proposed by Karayan Hydropower Corporation in 2016. According to the company, the P4.37 billion project will make use of 99.3 hectares of land located in Tabuk City, Kalinga. The proponents of the project managed to garner funds through a high-interest P3.17 billion loan to China CAMC Engineering Co. Ltd to cover its finances3. Another is the hydropower plant project spearheaded by AboitizPower and its wholly-owned subsidiary Hedcor, Inc. Last 5 May 2015, the plant was launched in Mountain Province and set to deliver 55-gigawatt-hours4 to supply the Luzon grid5. The National Commission for Indigenous People has likewise approved of these projects despite the Cordillera peoples sustained opposing clamour6. Despite being an alternative to fossil fuels-based sources of energy, mega dams are opposed by environmental advocates since they are known to cause negative impacts to the environment due to its enormous size. These include deforestation, trapping of sediments, and blocking of fish migrations that affect both upland and freshwater ecosystems. In addition, these mega dam projects will still maintain the privatization of energy sources. 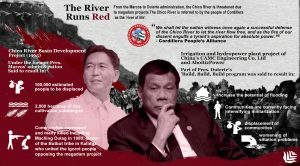 With this narrative, we see the Duterte administration’s revival of corporate Chico River projects as one of its numerous maneuvers disconcertingly reminiscent of the martial law period. In this issue of resource conflict due to corporate interests, similarities between Duterte and Marcos are becoming more and more pronounced. We see the same strategies used to establish profit-driven relations with big local and foreign corporations at the expense of indigenous peoples’ livelihood and ancestral domain. Anti-people policies proliferate and dissent instantly suppressed. Duterte’s reaching ‘Build, Build, Build’ program soars with a smokescreen of progress but ultimately, we ask, progress for whom? Igorot leaders are unwavering in its call for big corporations to keep out. In April 2018, on the 38-year mark of Macli-ing Dulag’s martyrly death, the Igorots, rightful proprietors of Chico River and the Cordillera, established Cordillera Movement Against Tyranny headed by Cordillera Peoples Alliance. The struggle for the advancement and defense of indigenous peoples’ rights and social justice continues even with the intensifying militarization and state repression invading their ancestral domain. Cariño, Joanna K. (1980). The Chico River Basin Development Project: A Case Study of National Development Policy. Krishnamurthy, K.V. (n.d.) Textbook of Biodiversity.